I’m Reagan Summerside, owner of the Prissy Fox Consignment Shop, Bruce Willis...the black and white canine version who rescued me more than I rescued him...and a dilapidated Victorian that I love, pealing paint and all. So how did I get lucky enough to have the delicious Walker Boone want to marry me? Good question, I’m not exactly a lucky kind of girl. I’m more of a my hair turned orange because I dyed it myself kind of girl, or will you go to the prom with me because there’s no one else to ask. Why wasn’t I seizing my moment in the sun? Why didn’t I tackle Boone to the ground and have my way with him all the while yelling Yes, Yes, Yes, I’ll marry you! What was my problem? all to the man I loved more than life itself. Yep, this is me alright, Reagan Summerside, in the opening of Lethal In Old Lace coming out March 13. And my question to you is...do you believe in karma? I do especially when it comes to men! Who else would be stupid enough to marry Hollis Beaumont the third and to this day I’m not sure why I did it. What did I do to deserve this? My messy room when I was a kid? Flunk biology? Deep down I think it was one of those ticking clock things that messed with my brain. Not the have a kid part but the marriage part. This is Savannah and around over here everyone over twenty-five..but me was married. Or at least it felt that way. I should have known my karma were bad when Hollis convinced me to use my grandmother’s inheritance to by Cherry House, a lovely Victorian fixer-upper. That I did the fixing up was okay since Hollis doesn’t know one end of a screwdriver from the other but when he tried to get Cherry House as part of our divorce settlement that was the livin’ end. But now I’ve got the wonderful Walker Boone asking me to marry him. What did I do to get so lucky!! I’m not sure but I’m all in. YES! I will marry Walker. Now I just have stop Mamma and Auntie KiKi from hijacking the ceremony, reception and choice of dress. The one they’ve picked out has enough tulle to cover all of Georgia! And did I mention there’s a killer on the loose? Wedding Day and Foul Play may be more than the title of the next book! 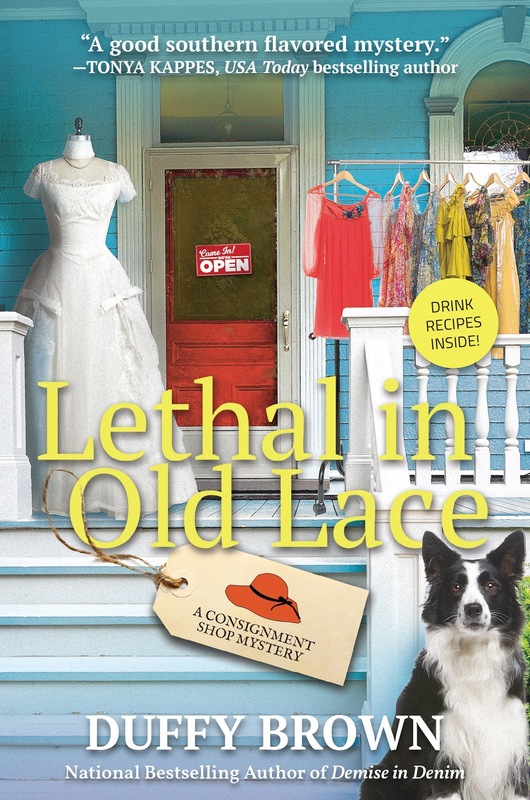 Can't wait for the opportunity to read "Lethal In Old Lace". 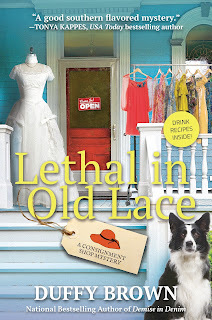 Looking forward to reading Lethal in Old lace. This was SO much fun! I love getting glimpses of characters from other stories in the series, and this has been such an interesting courtship, lol. I can't wait to read about the nuptials, I know they definitely will be unique! Congrats on the new release!